To know if a plant will do well in a new environment, compare the climate of the new place with that of its place of origin. This method, which helps us to foresee success in transfer, was first suggested by Krasnov (1887) and was later described and put to practical use by Mayer (1906). According Krasnov and Mayer, the more the climates have in common the more successful the transfer will be. Although many exceptions to this rule exist, the native original home climatic environment is the first thing to study. Dry statistics given below are dull to read but necessary to know if one going to introduce new plants. 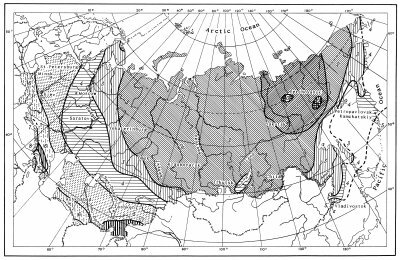 The former Soviet Union covers one-sixth of the earth’ land surface and naturally, within such a huge territory, very different climatic conditions occur. Significant to any discussion of this vast territory is to mention that the FSU extends from eastern Europe to the circumpolar east into northern and central Asia. Bordered in the west by the Baltic Sea, the eastern limit washes into the Pacific Ocean and the northern one into the Arctic Ocean. This country stretches from high northern latitudes at Cape Chelyuskin (77° 43' N) to the south at Kushka on the Afghan frontier in Tajikistan (35° 08' N). East to west, the country extends from the Baltic sea (19° 38' E) to Cape Dezhnev (169° 40' W). If you were to travel between its farthest points from East to West, you would cross a staggering 11 time zones. The Arctic Ocean impacts almost the entire territory because the highlands barrier the southern borders and therefore most of the territory declines to the north. The Urals are one exception: these mountains stretch from north to south, separating Europe from Asia. Chief to the Arctic influence is that most of the territorry is characterized by a much colder climate than felt at the same latitude in the United States and the rest of Europe. The 50° F (10° C) isotherm for average annual air temperature runs across only northern United States, crossing the Great Lakes, but descends across well southern FSU, crossing the Black and Caspian Seas. Temperatures in the major portion of the FSU are therefore comparable with those in the northern United States and adjacent Canada, and also with those in northern and central parts of Europe. Climatic hardiness zones based on minimum air temperature are widely used to indicate the probable cold tolerance of garden plants. Zone maps have been published for western Europe, South Africa, Australia, New Zealand, Japan, China, and North America. When comparing FSU climates with those of other countries, one faces a few difficulties. One awkward obstacle is the use of Celsius scale in the FSU but the Fahrenheit scale in the USA and Great Britain, therefore requiring the conversion of each figure. The other obstacle is not so easily resolved in that these countries use different indexes for climatic characterization. In Russian botanical and gardening literature, diverse indexes describe climate variation. The most frequently used indices employ the average annual air temperature and average temperature for the coldest and the hottest months (usually January and July). Information about minimum temperatures is not often mentioned. Therefore the index usually basic for climate in many countries, e.g., the American "Hardiness Zones", are absent in Russian botanical books. Other data for minimum air temperatures are available in the specialized Russian meteorological literature, but are not at all popular among Russian gardeners and botanists. FSU botanists and gardeners often used the climatic types established by Alisov (1947, 1956) and Borisov (1965, 1967). The classification proposed by Alisov was based on radiation balance (temperature) and air circulation (wind direction). His climatic types were accepted by Kaigorodov (1955) as a basis for his Natural Global Climate Classification. Kaigorodov accepted Alisov’s classification as the one most suitable for botanical studies and since than many botanists employ it. 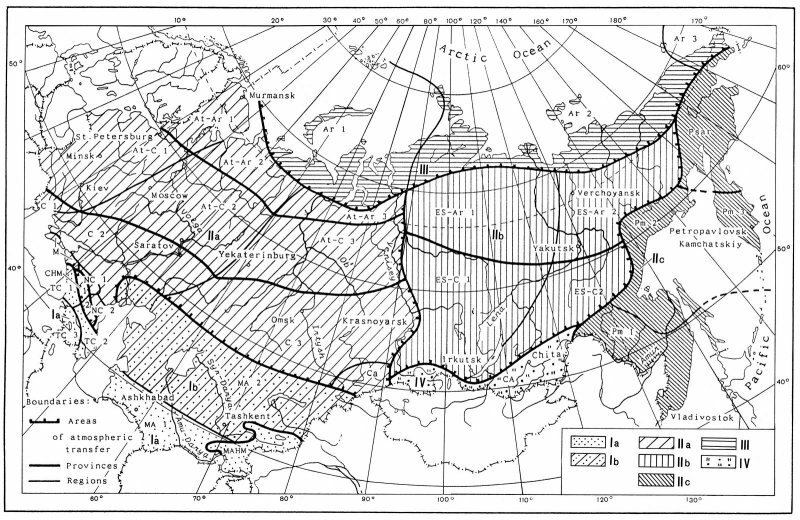 According to Alisov, there are three climate types in the FSU: subtropical (or warm temperate), temperate, and arctic. Different territorial parts may be influenced by different main geographical factors. (Map 1). The climate of the western regions, under the influence of the Atlantic Ocean, was termed the Atlantic; that of the mainland regions was the Continental, including southern Asian regions; as well as the Pacific and the Arctic for eastern and northern regions, respectively. Map 1 gives a general picture of the types of climate in the FSU. Of particular importance on a regional scale is the effect of continentality and proximity to oceans. Continental climates show a rapid and sustained rise in temperature in spring, promoting growth of plants and greater seasonality. Oceanic climates, in contrast, have a less seasonal variation where early growth may suffer from late spring frosts, and cold-tolerant plants may suffer from excessive winter moisture. 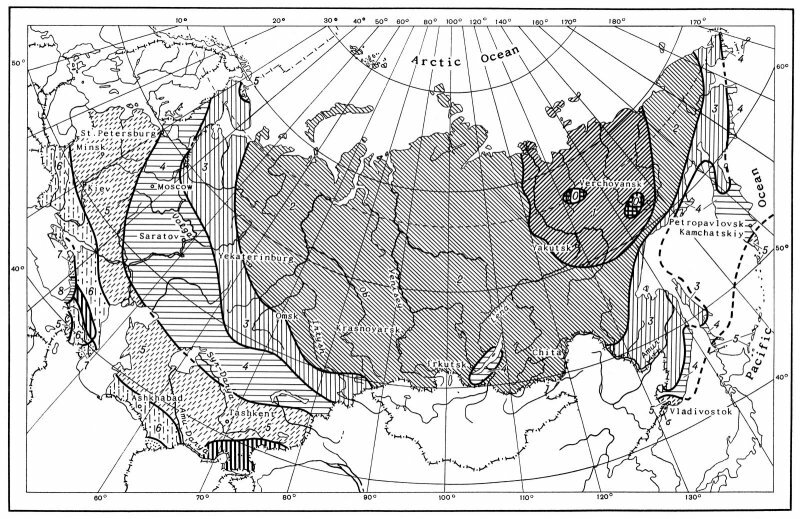 A later FSU climatic classification by Gerasimov (1964), Grigoriev and Budyko (1971) was based on the sum of the temperature of the earth's surface and the aridity index. FSU territory divided into a series of large zones that are corresponded closely to observed distributions of vegetation and soil. However, they cannot relatively compare with the popular Western map of "Hardiness Zones." 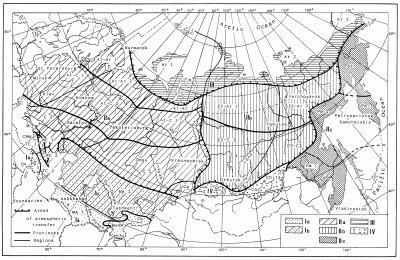 Russian climatic types are determined by a number of criteria and are not based on just a single element, as are “Hardiness Zones" in the United States. The hardiness of a plant in a particular locale is affected by a number of factors, of which cold is only one. When used with caution, hardiness zone maps serve as valuable guides to the major environmental conditions for winter survival of plants. Such a map is provided here for the territory of the FSU (map 2). Since the most reasonable comparison is probably made with the North American land-mass, map 2 is designed to correspond to USDA Climatic Zones Map, which has 11 zones based on 5.56° C/10° F differences in average annual minimum temperatures. Climatic changes attributed to the greenhouse effect have not been considered because available averages means do not cover the last dozen years. Since some places exist in the FSU where the average annual minimum temperature is too low for their inclusion in the North America zone 1, a zone 0 has been added to map 2. Conversely, there are no regions within the FSU with climatic equivalents to zones 11 or 10. A warm and mild climate is found in the Caucasus. A very small area in the southwestern Caucasus, near the city of Batumi, falls within zone 8 and even to zone 9. Average temperatures of December, January and February are about 48° F (9° C); 0° C occurs very rarely and only for very short periods. The average minimum is ca. 25° F (-4° C) and the absolute minimum in Batumi was registered as 19° F (-7° C). This area is also remarkable for its annual precipitation of about 177.3² (4,500 mm) more typical of a tropical rain forest. The climate is obviously warm and humid. The coastal area along the Black Sea, from Batumi northward to Sukhumi, refers to zone 8. Its average January temperature is 35° F (2° C), with a minimum air temperature once recorded as 15° F (-9° C). However, cold periods with a mean temperature of 32° F (0° C) happen very rarely and last only a short time. Further to the north, from Sukhumi and Gagra to Tuapse, the temperature is a bit lower and there is less precipitation, recorded near Tuapse and Sochi as half that in Batumi. This area can be referred to zone 7. Another warm place in the Caucasus is the southeastern Transcaucasus along the Caspian Sea. However, there is a great difference between the eastern and the western Trancaucasus, and eastwards the climate changes from humid and warm to one that is dry and hot. The annual average precipitation in some places in the eastern Trancaucasus is about 8.1" (ca. 200 mm), which is regarded as semi-desert, but in some places (e.g. the Lenkoran region), the humidity is much higher, and during autumn the precipitation can reach 12" (ca. 300 mm) a month. The winter in the eastern Transcaucasus is colder than in the western regions, and in Makhachkala the January mean is 10° C/18° F lower than in Sochi, in spite of the fact that both cities are on the same latitude. A small area near the city of Lenkoran has a very warm winter, yielding the earliest crops in the FSU. This area used to be popularly called the "Kremlin Kitchen Garden" because much of the produce was sent to the Kremlin in Moscow. This southern coastal area along the Caspian Sea can be referred to zone 7. The Armenian Highlands in the central part of the Transcaucasus have a continental type of climate. The average annual precipitation is about 12-30" (ca. 300-800 mm) at the highest elevations, and 6-12" (150-300 mm) on the plains. The rainfall reaches its maximum in spring time, the average mean January temperature is 10° F (-12° C) in the mountains and the maximum mean in July is 65° F (18° C). In the Ararat Valley the absolute recorded maximum is 110° F (43° C), in winter the temperature can drop to -10 to -22° F (-25 to -30° C), and the minimum is -26° F (-32° C), with average minimum mean -11° F (-24° C). Therefore this region’s climate corresponds mostly to zone 5 but also in part to zones 4 and 6. In the northern Caucasus, the climate is also a continental one. The average January temperature in Pyatigorsk is 23° F (-5° C) with an absolute minimum of -24° F (-32° C); in Novorossiysk, January averages 34° F (1° C) with an absolute minimum of 4° F (-16° C). Considering these average minimum temperatures, this region can be best refered to zone 5 with only some places to zone 6. The whole western portion of the FSU lies under the influence of the Atlantic Ocean, within climatic zone 5, and some southwestern areas fall into zone 6. One exception is a narrow coastal area in the southwestern Crimea (or Krym Peninsula). Here, the favorable weather conditions largely result from the mountains that provide protection from northern winds. The average minimum temperature is about 17° F (-8° C) in Yalta, and the precipitation is 27.5" (70 mm) in January, and 10.6" (27 mm) in July. The region falls in zone 7 and some protected places with southern exposure close to zone 8. Northern and central areas of European Russia are best referred to zones 4 and 3 with the winter colder to the east but warmer to the west. The Asian component of the FSU consists of Siberia, the Russian Far East and Central Asia that was formerly known as Soviet Middle Asia. Central Asia includes the republics of Turkmenistan, Uzbekistan, Tajikistan and Kyrgyzstan, and also the southern part of Kazakstan. The region can roughly be divided into two regimes. Areas to the south of 40° latitude are subject to diverse climatic influences and have particularly variable weather, especially in winter. In any given place, winter temperatures can range dramatically from -15° F to 70° F (-26° to 21° C), and even the average temperatures also range widely. For example, in Ashkhabad the average January mean can be 22° F (-5° C) in one year but 45° F (7° C) in the next. Southwestern Central Asia, mainly southern Turkmenistan, belongs to zone 6. In the mountainous regions occupying southern soviet Central Asia, the temperature often depends on exposure. Thus the January mean near Lake Issyk-Kul’ is ca. 25° F (-4° C), whereas in Naryn, which is situated 1° degree further south, the temperature drops to 0° F (-18° C). On the high mountain plateaus of the Pamiro Alay, the July temperature mean is 60° F (16° C), while the January mean is 5° F (-15° C). The annual average rainfall is less than 3.9" (100 mm), indicating that the vegetation in the Pamir is high mountain desert. Above 40° N latitude, in northern Kazakstan, the winters are severe but the summers hot. The average January temperature is about -20° F (-29° C), with minimums to -40° F (-40° C). Therefore, the northern regions belong to zones 5 and 4 with some places assigned to zone 3. Most of Central Asia and Kazakstan is characterized by very hot summers (up to 120° F, or 50° C) and insufficient moisture (in some places less than 2.2" or 55 mm per year). The major portion of Asiatic Russia belongs to Siberia, which is divisible into two large regions: western Siberia and eastern Siberia. The winters become more severe from west to east and in both Siberian regions, minimum temperatures drop to -40° to -50° F (-45° C). Therefore, these areas belong to climatic zones 2 or 1. The central part of eastern Siberia is even colder, with minimum temperatures dropping below -50° F (-45° C). In fact, the cities of Verkhoyansk and Oymyakon are known as the coldest recorded cities in the Northern Hemisphere, and their winter minima (or lowest means) to -94° F (ca. -70° C). Only the Greenland Ice Plateau can match this extreme cold in the heart of eastern Siberia. No such zone appears among the American "Hardiness zones" these conditions of such extreme cold simply do not occur in North America. In contrast Siberian summers are warm, with an average July temperature in the Transbaykal area of 68° F (20° C) with a maximum of 95° F (35° C). To the north there are short summers and long winters, and with snow cover extending for 8 or more months, permafrost exists despite the rather warm summers. Therefore, both eastern and western Siberias belong to zones (0), 1 or 2. However, some areas can be referred to zones 3 or 4 notably, the Altay and Baykal areas. The climate of the Altay mountains is unusual due to its sharply contrasts in orographic conditions. The lowest minimum recorded in some places in the Altay is -45° F (-43° C), but the January mean can be - 2° F (-19° C) at Gorno-Altaysk. Summer in the Altay is not as hot as in neighbouring Central Asia and southern Siberia. The annual precipitation also differs from that of neighbouring territories, increasing to 31" (ca. 800 mm) in Altay over a drier Central Asia. The climate near Lake Baykal also differs from that of most of southeastern Siberia. The average January temperature near the lake is 15° F (-9° C), whereas in Verkholensk, a city 105 miles (170 km) away, the winter is much colder, and average of the same month is -20° F (-30° C). Moreover, summers around Baykal are cooler than in southern Siberia and the average July mean in central Baykal is 50° F (10° C), whereas in the city of Bargusinsk (only 70 km farther E) it rises to 62° F (17° C). 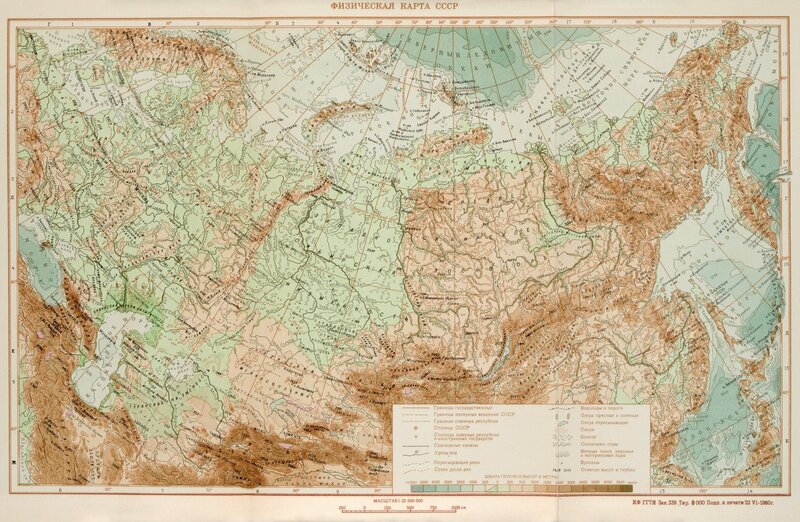 The Russian Far East extends from 70° N to 42° N latitudes, exhibiting even greater variety in climates. The continental landmass, and the Pacific Ocean with the cold current from the Sea of Okhotsk, both influence the climate. The continental influence is especially prevalent in winter. Winter in the Russian Far East is not as cold as in Siberia, but it is much colder than would be expected from its geographical position. For example, the "Kedrovaja Pad" reserve, south of Vladivostok, lies at about the same latitude as Marseille, France, which enjoys a subtropical climate. However, the January mean at "Kedrovaja Pad", is 10° F (-12° C) with a lowest minimum temperature of -11° F (-24° C). The region belongs partially to climatic zone 5 and in mountain areas to zone 6. The Bay of Olga, which lies on the Sea of Japan at the same latitude as the city of Tuapse on the Black Sea, has a January mean of about 10° F (-12° C), which is very much lower than that of Tuapse, lower even than that of Moscow. These regions to the north of Vladivostok refer to zones 5 or 4. On the Kamchatka Peninsula the coldest areas have a January mean of -1° F (-18° C), with a minimum down to -35° F (-37° C). Therefore the Kamchatka belongs to zone 3, but some places such as the Geyser valley belong to zones 4 or 5. The winters in the Anadyr region are much warmer than in neighbouring East Siberia with the coldest month being February with an average temperature of -20° F (-30° C) and a minimum of about -32° F (-35° C). This northern region belongs to zones 2 and 3. The Pacific Ocean influence prevails in summer, especially in the central and southern parts of the Far East, but the remaining northern portion is under an Arctic influence. Seasonal winds originating in the Indian Ocean to the south bring heavy rain to all the Pacific coastal areas, especially in July and August. The annual rainfall in the Maritime region (or Primorskiy Kray in Russian) is 20-40" (ca. 500-1,000 mm), but in any given place it can vary markedly from 40" (ca. 1,000 mm) in one year to 136" (ca. 3,500 mm) in the next. Dense fog is prevalent common along the coast during summer. Sakhalin Island and the Kamtchatka Peninsula have less severe extremes of climate, than mainland territories of the Far East. The Pacific Subarctic region differs greatly from the monsoon region in having much shorter summers. An average September temperature is already as cold as that in winter time being of 30° F (-1° C). To summarize, territories of the FSU fall largely within zones (0), 1, 2, 3, 4 and 5, with zone 6 seen mainly in the Caucasus, southern Central Asia, and the southern Far East. Zone 7 falls in the Caucasus and Southern Middle Asia; zone 8 in a narrow coastal area in the southwestern Crimea and Caucasus (along the Black and Caspian Seas) with zone 9 noted only along southwestern coastal Caucasus. A Hardiness zones map is an invaluable aid to determine under which conditions plants may be expected to survive winters. It is also important to know what kind of environmental conditions favor a plant during its growing season. In this connection the sum of temperatures is a particularly useful guide and the method was proposed by Reamur (1683-1757) still widely used in agriculture. Daily temperature means over 10° C (50° F) are added together to reach a sum known as the effective temperature. The data given below were taken from Davitaya & Sapozhnikova (cited from Shulz, 1981) and show the effective temperature sums for the localities listed. Places referred to the same zone sometimes have different sums of effective temperature. For example, Karaganda, Volgograd and Vyatka all fall in zone 4, but the first and last differ by 1200° in their sums of effective temperature. In Karaganda, the summer is very hot but in Vyatka it is much cooler. Therefore, even though the places fall within the same hardiness zone, they support different vegetation types as a result of different condition during the vegetative (summer) period.